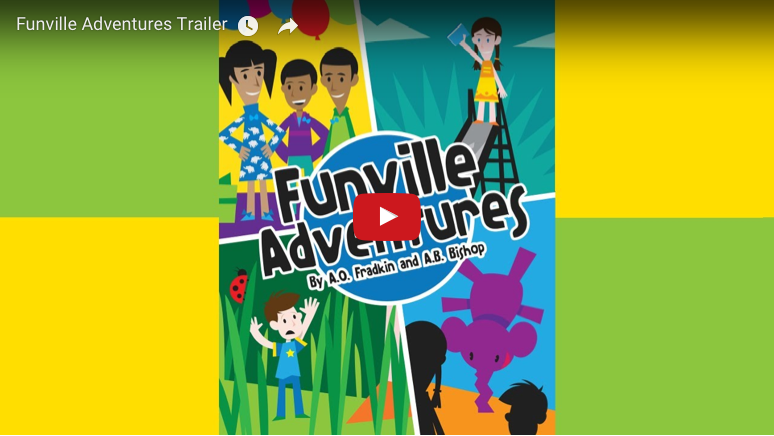 Funville Adventures tells the story of 9-year old Emmy and her 5-year old brother Leo who find themselves transported to Funville, a magical land whose ordinary-looking inhabitants have unique powers to transform objects and people. It’s an adventure book that has children anticipating the action as characters apply their powers to shrink or double the size of objects, replicate things, and turn things into elephants, lots of elephants. That these powers derive from mathematical functions is beside the point and in no way interferes with the telling of a good story. (For those wanting to dive more deeply into the explicit character-function connection, an addendum is provided for the purpose.) The authors, Allison Bishop and Sasha Fradkin, who met at Princeton when both were undergrad math students, are using story-telling to introduce mathematical concepts to children, and in so doing are pioneering a new genre: math-based fantasy. How is math incorporated into the story? The math is the characters. Each character personifies a mathematical function, and the power each character has derives from a different function: one can double an object’s size (f(x) = 2x), another can make copies (f(x) = (x,x)), and another can rotate (f(x) = π x) objects. Other characters have other powers. Some powers—but not all—are reversible, and part of the action is driven by Emmy and Leo having to figure out how to counteract the powers of one character with the powers of another. At one point, a character accidentally applies his power an unknown number of times to shrink Leo, and Emmy has to find someone whose power is to double the size of something so Leo can be restored to normal. How explicit is the math? It’s not explicit at all, or very little, and that was in keeping with our goal of writing math-based fiction that could stand on its own merits as a story that kids would want to read; we didn’t want the math to take the reader out of the moment. Math drives the action, but it’s under the hood. For those who want an explicit explanation of the function embodied by a character, we provide an addendum, but we don’t want parents or others feeling obligated to lead a math exercise. The whole point is for kids to pick up the math organically, not through exercises, but by applying their natural problem-solving and pattern-detecting skills and having fun doing so, similar to someone reading Sherlock Holmes and trying to think ahead to solve the crime. We have this scene with characters preparing for a party. They have to take one balloon and make many. Someone is blowing up balloons and someone else can make copies of things. 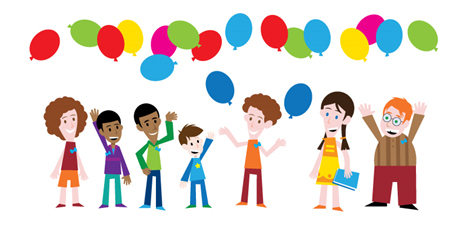 We go through the thought process: if you copy the balloon not blown up, then you have to blow up all the 100 balloons whereas if you copy it after it’s blown up, you don’t have to go through this step all those times. 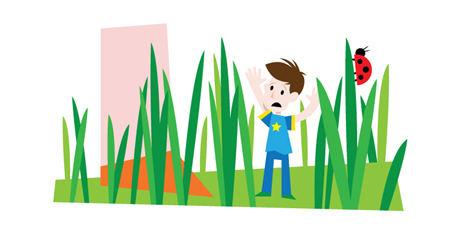 Why write for 5- and 10-year olds? This age group has a great capacity to learn more mathematical concepts than they are learning in school, and to learn them in a more abstract and generalizable way. Most kids don’t formally encounter a function until pre-algebra which is usually around 8th grade; so all of the sudden they are presented with f(x). That x is such a struggle when all you’ve ever seen is arithmetic where there is no x. We think functions belong so much earlier in the curriculum. And really, 5-10 is old enough. Children of this age love patterns; they love organizing their thinking that way. Why did you turn to storytelling to help teach math? The initial idea was my coauthor’s. She is a curriculum developer and teaches math for kids, so she’s around kids in the classroom and she sees first hand what motivates kids, what gets them excited. She also has two kids of her own, including a daughter who loves stories, just as I did when I was young. In fact, I hated math all through high school; I found formulas boring. Mathematicians and scientists need to think about storytelling as a way to get broader scientific literacy across to others. What really got me interested in math as an adult was the creative side of science research, and the human stories of how different people make different discoveries. Why them? Why that idea? What was it about that context and that time that sparked an insight? Storytelling is fundamental to everything. Mathematicians and scientists need to think about storytelling as a way to get broader scientific literacy across to others. We as scientists don’t optimize the communication part; we spend so much time on the research. But we need to be able to explain science to someone who hasn’t spent years delving into scientific questions. People should be able to more easily see the creativity and beauty in science. So many people don’t get there. But storytelling can provide a jumping-off point by breaking things down into pieces that people can individually follow and then fit into a larger framework. It’s how stories are told. Take Game of Thrones, an immense world with so many interweaving relationships. We as an audience are never told that there is a world and there are five houses and there are a hundred people in each house; we don’t see in the beginning the huge, overwhelming thing. We start with a single character and by observing what that character is doing, we begin to care about what happens next. As this character interacts with others, we learn about these new characters and piece by piece we begin to understand the larger world they inhabit. We could explain science in that way; we should explain science in that way. What was the hard part in putting together the book? Trying to get an agent and a publisher. Funville Adventures is not a typical kids book, it’s not a typical activity book so it doesn’t fit existing categories. It didn’t help that we are new authors trying to pioneer this new genre of math-based fantasy. While everyone said that a math-based fantasy book sounded interesting, no one knew if there was a market for it. Our publisher, Natural Math, focuses more on activity books but was willing to take a leap of faith with us and try this direct-to-kids fiction format. The publisher—we never did get an agent—worked with us on a Kickstarter campaign to both validate the model and to connect with others seeking innovative approaches to math education. Money raised will help cover the costs of producing the book, which will come out in August. What has been the response so far to the book? It’s been good. In beta-testing the book, we’ve seen kids carry forward ideas taken from the book by inventing their own function characters. It gives support to this idea of using storytelling to convey mathematical concepts. Ideally we want to pioneer not just this one book, but a whole genre of math-based fantasy. We’re thinking of doing a follow-up with coded messages and using encryption to keep secrets. Kids love secrets. We’re even thinking of eventually doing a book with modular arithmetic, like rhythm and periodicity; the mathematical concepts will be different, but the use of storytelling to make the concepts compelling and understandable will the same. It’s a formula we think will work for young and older children, too. Maybe even adults.